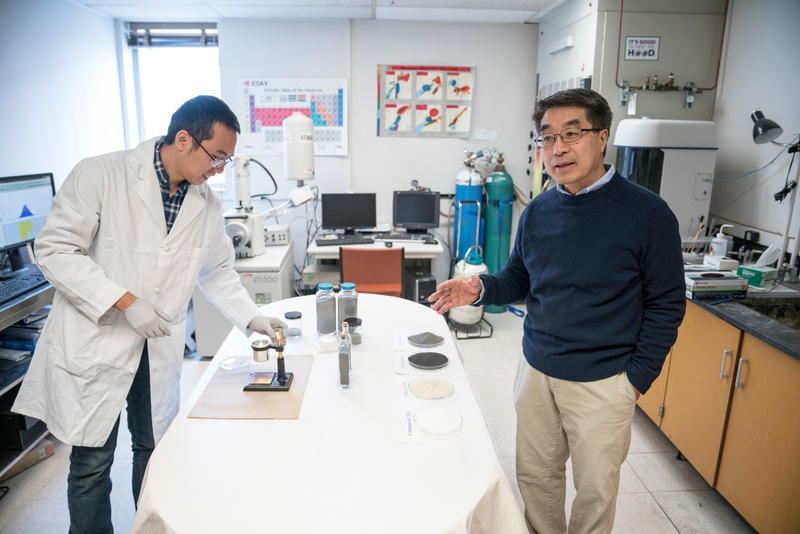 Zhigang Zak Fang, professor of metallurgical engineering in the College of Mines and Earth Sciences (right) and Pei Sun, research associate in the Powder Metallurgy Research Lab (left) describe the process to reduce commercial titanium dioxide into the final pure titanium powder. In December 2017, the National Academy of Inventors (NAI) elected Zhigang Zak Fang as a 2017 fellow. 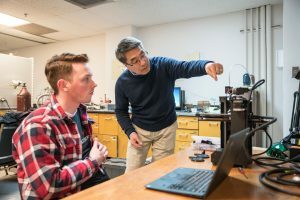 Fang, a professor of metallurgical engineering in the College of Mines and Earth Sciences, was an obvious choice; he has over 50 issued patents, several more pending and multiple new projects in the works. Fang embodies the spirit of NAI, an organization that honors academics who have facilitated exceptional inventions that impact society. He joins 12 other U faculty with NAI fellowships. Fang’s research focuses on the metallic materials that are used in energy efficiency, energy storage or energy production. As a metallurgical engineer and materials scientist, Fang works to develop metal alloys and processes to be more efficient and less expensive. Specifically, his work has focused on the processes and mechanical properties of metals made from metal powder. Lately, one of his focuses has been titanium, a so-called “wonder metal” that is strong, lightweight, corrosions resistant, bio-compatible and abundant but not widely used due to its cost. Fang invented a process that can reduce the cost of producing titanium powder by half and the processing energy of the primary titanium metal by 40 percent. Fang has received assistance from the U’s Technology & Venture Commercialization with patents and a spin-off company. @theU sat down with Fang to talk about his prolific research and his motivation to keep innovating. Congratulations! What was your reaction to being honored as a National Academy of Inventors fellow? Oh gee, I was very happy, gratified. My wife said, ‘Well, you work hard every day and you put in so many Saturdays, I guess it paid off.’ I was very satisfied. Not that I need the honor of the fellowship to continue to work hard, but it’s nice to know that it’s being recognized. What drives you to invent and innovate? I worked in industry for 11 years before joining the faculty in the Department of Metallurgical Engineering. I had a lot of practical, industrial experiences. That sort of shaped the way I think and the way I work as an academic, too. So, my career has been focused on working to solve industrial and practical problems. The metallurgical industry is an energy-intensive industry. It takes a lot of energy to produce primary metals from minerals, and to manufacture with metals to make auto parts, airplane parts, computer parts. No matter how much high tech we have, we rely on metals to build it, so metals will never go away. But, to improve the energy efficiency of metals production, we have to find better processes that are more energy efficient, and produce less CO2 emissions. My research group has deliberately defined our focus on energy efficiency, energy production, or energy storage. We’re not working directly on solar or wind or electric batteries, but on the metal powders that are often the source materials that those products are made of. In many situations, to make these products, you need to make powders first. Let’s take a step back. What is metallurgical engineering? You look at many things around us — auto parts, airplane frames, engines, and many human body implants — these are mostly made out of metals. But how do you get from a mineral in the ground that contains metal ore to a final product? And, it’s not often that we use pure metals. We have to make alloys in a certain way so that they have the physical, chemical, and mechanical properties we need. Then you take that alloy and you make the product. That entire process, from minerals to pure metal, from pure metal to alloys, and from alloys to products, is what metallurgical engineering is. Fang (right) discusses a new project with undergraduate researcher, Jarom Chamberlain (left). 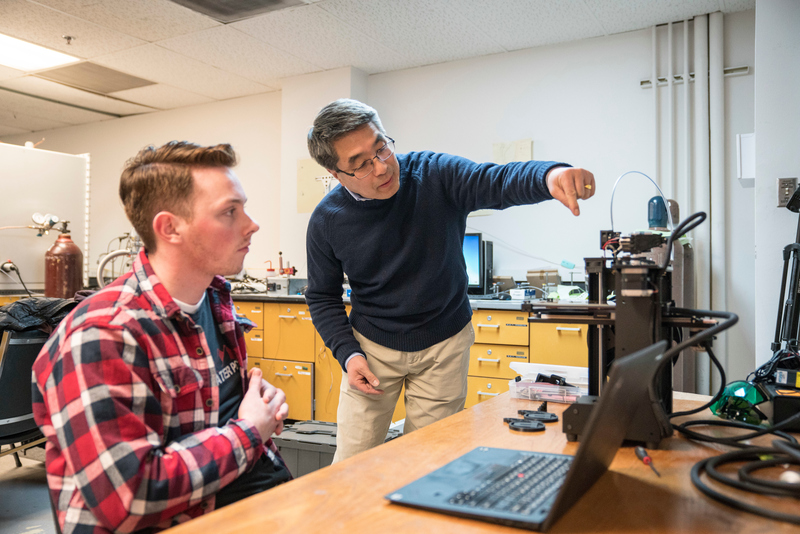 Under Fang’s direction, Chamberlain adapting a low-cost, off-the-shelf 3-D printer designed for printing using plastic filaments to print with metal powders using a new process, which is the newest invention by Fang. Your recent work has focused on making titanium more efficiently. Why titanium? People say that titanium is a wonder metal, or a metal of the future. I like to think of titanium as a metal of the present. The reason? Titanium has great properties. It can have the same strength or toughness as steel, but with half the weight. Automobiles use steel, but we could use titanium instead. That would make automobiles more lightweight, consume so much less fuel and produce so much less emissions. It’s a great metal, but it’s not used nearly as much as steel because it’s too expensive. It’s not rare — it’s the ninth most abundant element, and the fourth most abundant metal in the Earth’s crust — but it’s expensive to extract, expensive to process, expensive to make things from it. So that makes it a good area for me to focus on as a scientist; it is a great challenge to find ways to improve the process to reduce the energy needed to produce titanium metal, and therefore reduce the cost. A couple of years ago, you discovered an efficient, less expensive way to reduce titanium oxide, the main component in titanium ore, into pure titanium powder. How did you do that? The current method, called the Kroll process, is very energy intensive. It relies on a chlorination process to prepare titanium tetrachloride (TiCl4) as the raw material for the reduction process to make pure metal. Chlorination is one of the cost factors because of its environmental risks. The Kroll process is also expensive because of the high temperature vacuum distillation step that is required. We came up with an approach to reduce titanium dioxide (TiO2) directly, without the chlorination. We use magnesium to reduce titanium oxide, instead of chloride. Titanium is difficult to make because it has a strong bond with oxygen. It’s hard to separate. But magnesium has an even stronger bond to oxygen. So, you can use it to steal the oxygen from TiO2. However, magnesium has its limits — it cannot reduce all of the O2. It leaves about one or two percent of the oxygen in titanium, depending on the temperature of the reaction. 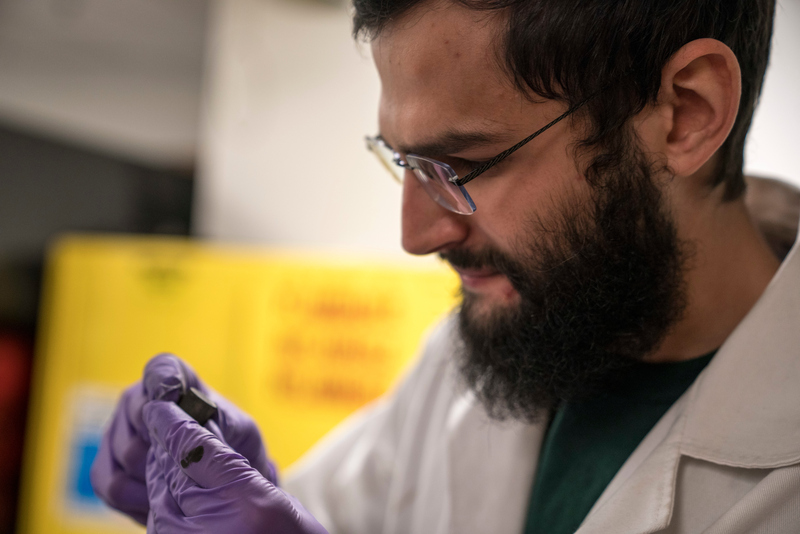 Omar Kergaye, a graduate student in professor Fang’s Powder Metallurgy Research Lab, admires a cylinder he made from pure titanium powder. He poured the powder into a container, tamped it down, then applied up to 20 tons of pressure to form a solid titanium metal product. Further, typically we use hydrogen to reduce oxygen in many metals such as iron, nickel, and cobalt. But hydrogen cannot reduce TiO2 or Ti-O solid solutions, because TiO2 is extremely stable and Ti-O bond is very strong. Our invention is this: Through experiments and thermodynamic analysis, we discovered that when magnesium is used together with hydrogen to reduce TiO2, something magical happens. It works! A new chemistry was revealed. Here is an analogy. It’s difficult to knock a golf ball out of a ditch and drive it far. But if you put that golf ball on the top edge of the ditch, then it’s a lot easier to do it. This is what the hydrogen does to oxygen in titanium. If you’re in the ditch, you are stable. But if you’re on the edge of the ditch, you’re not stable. So, that’s what hydrogen does to oxygen in titanium to make this process feasible. It’s not a complex science; put titanium dioxide and magnesium powder into the blend and heat it up in a hydrogen atmosphere, and pure titanium metal is produced. Although it is simple, it was never done that way. We discovered this approach. So far, it’s very effective, and we believe this process has a lot of potential. How much does this affect titanium production? We did our energy and cost-modeling and predicted that the titanium metal powder we produce with this approach is going to be half of the current cost of Ti powder in the market. It cuts the processing energy of the reduction of TiCl2 or TiO2 by 40 percent compared to the Kroll process. What stage is the research in now? In this project, we partner with the companies: Boeing and Arconic. We demonstrated to them that we can make this titanium powder to meet their specific requirements, again and again. Last year, we received additional funding from the Department of Energy to do the pilot production. In 2018, we’ll be producing a few hundred kilograms, and maybe up to 1,000 kg of titanium powder, so that Boeing and Arconic can evaluate the product and validate the process. We need that validation, then it will be on its way to become commercial. Titanium is the most bio compatible material because it resists corrosion and fails to react to the human body. 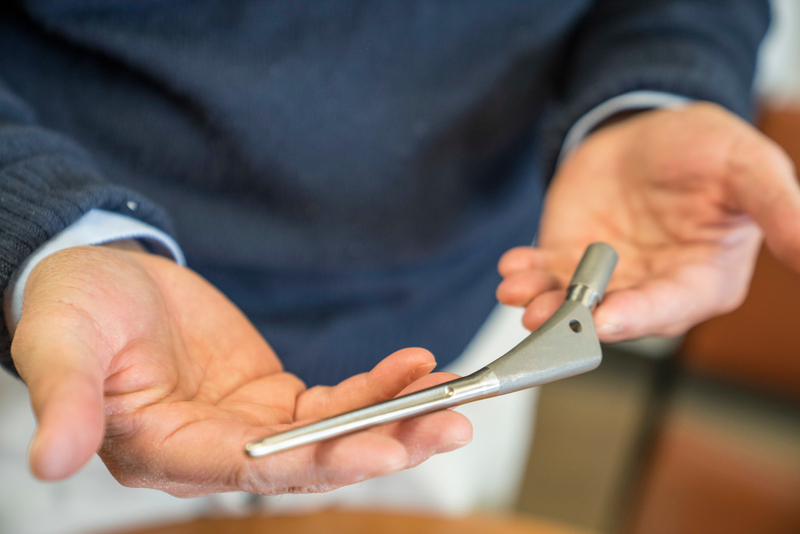 Here, Fang holds an artificial hip joint he made with titanium powder. The titanium powder process is just one of your many inventions, and you have multiple new projects in the works. How do you stay inspired? Well, everyone has something that makes him or her tick, so to speak. To me, the gratification comes from solving problems, from seeing something work because of my ideas and hard work. That is very gratifying. Because of experience and age (haha), I am fortunate to have the opportunities to work in several interesting and challenging fields, including the hard materials for energy exploration, metal hydrides for hydrogen, thermal energy storage, and light metals for structural applications. There are plenty of challenges in all these fields. Keeps me busy. I would like to add that I appreciate the environment that the University of Utah provides for faculty inventors. I don’t know exactly how to characterize it, but we have a very free environment. I think the U strikes a good balance between rules and regulations, and encouraging faculty to innovate and have start-up companies. For example, I invented a type of tungsten carbide used for oil and gas drill bits that dig up to 20,000 feet into the Earth’s crust. I have a company that commercialized the tungsten carbide technology, and now another spin-off company to commercialize the titanium powder technology.